Easy-to-use, offsite cloud backup storage subscription that turns Acronis Backup 12.5 into a powerful hybrid cloud backup solution! With Acronis Cloud Storage, customers can enjoy a universal, cost-efficient, easy-to-use, and scalable software-defined storage solution that combines block, file, and object workloads and uses industry-standard hardware. 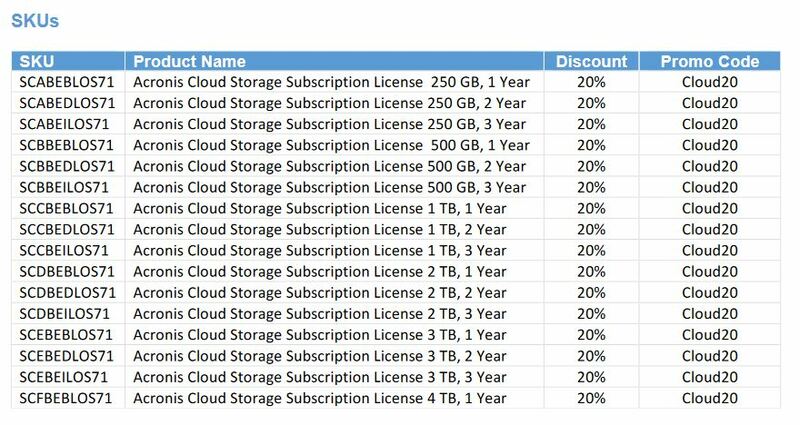 •20% discount on Acronis Cloud Storage New licenses. •Promotion only applies to new business deals, not maintenance renewals or upgrades. •Applicable for territories: Belgium, Luxembourg, Netherlands, Denmark, Finland, Norway & Sweden.